One of the most popular trends in the home, outdoor kitchens can drastically improve the possibilities for cooking and entertaining. By providing an updated and expanded living space, outdoor kitchens add value to your home. Additionally, an outdoor kitchen allows you to prepare and serve meals in the comfort of your newly re-purposed space. Your friends and family will love the inviting social atmosphere that an outdoor kitchen creates. Furthermore, you will love the functional aspect of cooking in style. With an outdoor kitchen, you can take your party outside or enjoy a relaxing meal in the comfort of a natural setting. Imagine having a quiet breakfast outside, hosting a luncheon, or experiencing a beautiful sunset as you cook dinner. Not confined by traditional indoor space, outdoor kitchens have limitless potential. 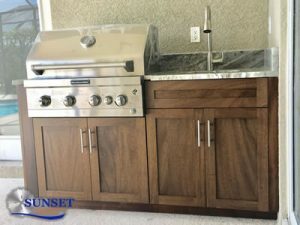 If you’ve ever felt the frustration of having “too many cooks in the kitchen,” you’ll see that everyone’s welcome in a new outdoor kitchen by Sunset Custom Cabinetry and Woodwork. When you are cooking or entertaining, outdoor kitchen cabinets provide easier access and storage of your cook and dishware. With your outdoor kitchen cabinets, you can eliminate having to run inside to grab cooking ingredients, plates, or utensils. Your custom outdoor cabinets improve the functionality of your kitchen, beautifully framing your appliances. And also, adding extra charm to your cooking area. 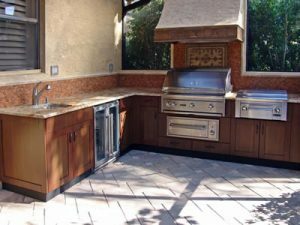 Our team will fit your outdoor kitchen cabinets to accommodate any type of outdoor space. Our outdoor cabinets are weatherproof, so they will look good in any season. We use special, high quality building materials to prevent fades, cracks, or splits. Because they are waterproof, you won’t have to worry about rain or leaks. We make each piece by hand, ensuring the quality of our craftsmanship. With our design and building expertise, your outdoor cabinets will have the durability and look that you’ve always wanted in a kitchen. No outdoor kitchen is complete without a built-in grill. As any cook knows, the grill is where all of the action happens. Your custom built-in grill is a durable and sleek solution for all of your grilling needs. Without having to lug heavy portable equipment around, you can show off your cooking skills and the brilliance of your kitchen design at the same time. We will custom fit your built-in grill to complement your outside kitchen and cabinetry. Because you won’t be heating up your kitchen inside, your outdoor built-in grill will save you money on air conditioning bills. With multiple options for size, style, and model, your built-in grill adds a truly customized and personal touch to your outdoor kitchen. When considering outdoor kitchen designs, there are many options to choose from and many things to account for. We will work with you to determine the best fit and materials for your home. With an emphasis on beauty, durability, and longevity, we solve all the issues kitchens typically present. Our outdoor kitchen designs are custom built to avoid restrictions on size and space, while maximizing the attractiveness of your landscape. We begin by taking precise measurements, and creating 3D models. Finally, we will meet your exact specifications to create a unique design that you can’t get anywhere else. Let our expert team guide you and simplify the process of creating the outdoor kitchen design of your dreams. Serving as counter space, a prep station, and seating for your guests, outdoor kitchen islands have a variety of uses. Outdoor kitchen islands combine function with décor, as they can provide extra storage while complementing your custom cabinetry. Whether you’re grilling, baking, or just spending time outside with your family, you will love the possibilities that an outdoor kitchen island adds to your cooking and entertaining options. Beyond their utility, outdoor kitchen islands serve as a focal point of your design, accentuating the beauty of your kitchen. With many options and features to choose from, let us build your ideal outdoor kitchen island. Outside kitchens have the potential to completely redefine homes. Traditional indoor kitchens have long held the stigma of work. However, outside kitchens can liberate families from feeling like cooking has to be a chore. By providing a more spacious, relaxed atmosphere, outside kitchens allow for more graceful movement in an entertaining and natural space. Inside kitchens are all about enclosure; especially in older homes, they can feel too hot and crowded. By contrast, outside kitchens provide an ideal use of space. Unlike their indoor versions, outside kitchens do not have to be retrofitted into a pre-existing and limiting area. Having outside kitchens custom built allows for creative solutions to problems that inside kitchens just can’t solve. The summer kitchen is a traditional American style dating back to the 18th century. They were originally conceived as a solution for cooking during the hot months. Today, the concept of a summer kitchen has completely changed in a modern environment. Now, your summer kitchen can be your cooking, living, and entertaining space in every season of the year. You’ll have the comfort and enjoyment of the outdoors while capturing those summer vibes all year long. Our meticulous design, building, and installation process will help make your ideas come to life! Allowing you to carry on the tradition of a summer kitchen in a modern, trendy way. At Sunset Custom Cabinetry & Woodwork, we want to help you make memories that will last a lifetime. From the stages of planning, design, build, and installation, our expert team is ready to serve you. Allow us to create an outdoor kitchen that will let you see your home as you’ve never seen it before.